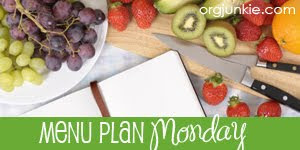 Be sure to visit I'm An Organizing Junkie for more than 200 other menu plans and Mindful Menus at Chive Talkin' for more healthy, made from scratch meal ideas. Oh yum all your meals sound fabulous this week. I just love breakfast for dinner meals. Great looking menu! Love your luau night! It looks delish! I am so going to make your pineapple rice to go with the pineapple pork chops I'm making tomorrow night. Great looking menu this week.